Stir together the flour, salt, and instant yeast in a 4-quart bowl of an electric mixer. With the dough paddle attachment affixed to the mixer, turn mixer on low speed. Slowly add in the olive oil and the cold water until the flour has absorbed it. Stop mixer and switch to the dough hook attachment. Turn mixer on to medium speed for 5 to 7 minutes, or as long as it takes to create a smooth, sticky dough. The dough should clear the sides of the bowl but stick to the bottom of the bowl. The finished dough will be springy, elastic. Sprinkle flour on a cool counter surface (stone preferable) and transfer the dough to the counter. Using a metal dough scraper, cut the dough into 6 equal pieces. Sprinkle flour over the dough pieces. Lift each piece and gently round it into a ball. If the dough sticks to your hands, dip your hands into the flour again. Transfer the dough balls to a lightly oiled sheet pan keeping about 3 inches between each mound. Lightly brush each mound with oil. Cover with a clean cloth and rest at room temperature for 2 hours. Alternatively, cover with cling-wrap and pan into the refrigerator overnight. The dough will keep for up to 3 days. If you have refrigerated the dough, remove from the refrigerator and allow dough to come to room temperature. Remove a dough mound from the sheet tray and place the dough on your floured counter surface. Sprinkle flour on the mound and dust your hands with some flour. Gently press the dough into flat disks about 1/2 inch thick and 6 inches in diameter and allow to rest for half an hour. Prepare your grill. You will need a good, hot grill with no flame, just bright burning embers. One-by-one, stretch the dough disk over the back of your hands and knuckles, bouncing the dough in a circular motion on your hands, carefully giving it a little stretch with each bounce. When the dough is stretched out into a thin even round about 9 to 12 inches in diameter, lay it onto a hot clean grill. Grill dough for 2 minutes. Using tongs, rotate the dough 90 degrees and grill for an additional 2 minutes, forming a cross hatch of grill markings. Flip over and do the same on the second side. 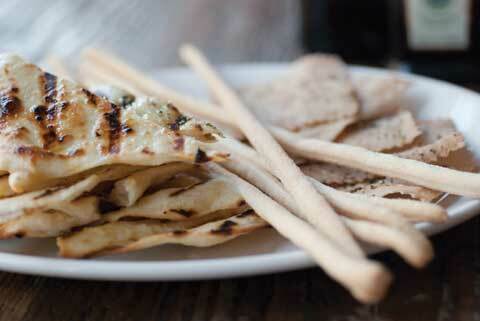 Remove the flatbread from the grill and transfer to a cutting board. Brush with extra virgin olive oil, slice and serve.